Now imagine we want to save more information than just isbn, title and author. We could add publisher, price, coverimage, release-date, and even more. The method-call would become rather unreadable. Furthermore think about a method returning data of a book. 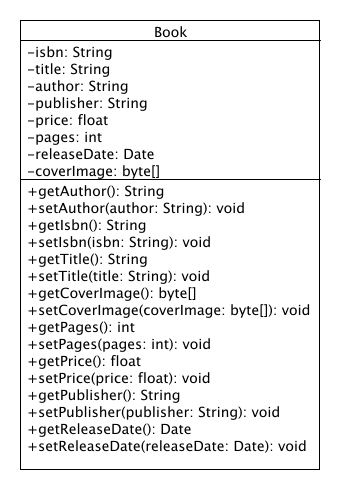 Through it is not possible in Java to return more than one value, you would have to make several calls to get all data. The solution for this problem is the Transfer Object. A Transfer Object is an object encapsulating data. A single method call is now sufficient to send and retrieve the Transfer Object and all included data. Data Access Object: A Transfer Object pattern is often used in combination with a Data Access Object pattern. In this example we consider an advanced Book.